The irony of the story is that Captain Redmond Prindeville and his crew took the Michigan boldly out of the safety of Grand Haven’s harbor on Feb. 9, 1885 in an attempt to rescue the steamer Oneida, which was trapped in heavy ice. The ice captured the Michigan and eventually sank it, while the Oneida escaped unscathed. Prindeville apparently thought the Michigan was well designed to resist the ice when he made the decision to put the vessel in harms way. 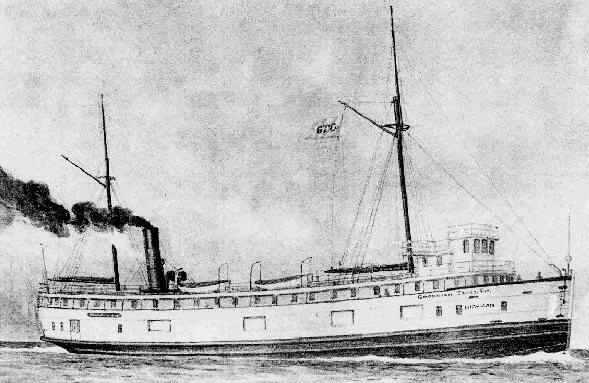 Built only four years earlier at Wyandotte, Michigan, for the Goodrich Transportation Company, the steamer boasted a sturdy iron hull. She was 203 feet long and had five water-tight compartments and a double hull with three feet of space between the hulls. It was common practice for companies like the Goodrich Transportation Co. to operate their steamships on the southern end of Lake Michigan during the winter months in those early years. By the time the ship was lost, however, it was owned by the Detroit, Grand Haven and Milwaukee Railroad Company, which also may have been running vessels in the winter. The lake rarely froze over and the company designed its ships to break their way through the ice that formed along the shore. But the year 1885 was an especially bad year for ice, as Captain Prindeville quickly learned. The saga of what happened to Prindeville and the 29 men who left on that fateful trip into the ice has gone down in the annuals of Great Lakes lore. The Michigan soon became captured by the ice and could not break free. On Feb. 17, after more than a week of being trapped, and with temperatures dipping to a severe 10 degrees below zero, a delegation of 17 of the sailors left the ship and made a dangerous hike across the shifting ice floes toward shore. It was realized by Prindeville that 1.) the Michigan was probably going to remain trapped in the ice until spring, and 2.) there was not enough food on board to keep all 30 men fed for that length of time. The sailors, armed with axes, pikes, ropes and rations, set off on the ice. It took them ten hours but they successfully managed to reach the shore where they found shelter at a house. After that they made their way through the snow to a train station at Bravo and then took the train back to Grand Haven. Five days after that, crew member George Sheldon also hiked to shore. He returned to the ship the next day carrying cigars, tobacco and newspapers for the remaining crew members. Sheldon repeated the trip the very next day, and this time made his way to Grand Haven to deliver letters and dispatches from the captain and crew. He returned to the ship on Feb. 25. The ice began to shift after that and two days later the crew found themselves 20 miles off Saugatuck. The next time anyone from the Michigan got to shore, they lowered a yawl and the men worked together to push and pull the boat, then float it over open water, until they reached shore somewhere near Glenn. Prindeville and his men maintained a vigil on the ship until March 19 when the shifting ice finally overpowered that double iron hull and punched a large enough hold in the ship to sink it. As the vessel settled the crew swung a lifeboat over the side and then pushed it a safe distance across the ice. They watched from about a quarter mile away as the ship slipped through the ice and disappeared. From there the crew worked its way across the mountains of ice floes until they reached the tug Arctic, which was lying about four miles off. Everybody reached the tug safely. Unfortunately the Arctic also was trapped in the ice, so everybody had another wait of about five more days. From there they walked to shore, reaching Holland, Michigan, on March 22. In 1906 there was an unsuccessful attempt to salvage the Michigan, but it was lying in 270 feet of water and divers could not get the job done. This year (2006) members of the Holland-based Michigan Shipwreck Research Associates rediscovered the wreck in the waters just off Holland, so its location now is marked on the maps showing locations of Lake Michigan wrecks. Divers said the ship rests upright. The anchors, ship’s wheel and smokestack are still in p lace. Also the divers said they located the capstan with the name S.S. Michigan, Wyandotte, Michigan, inscribed on it.